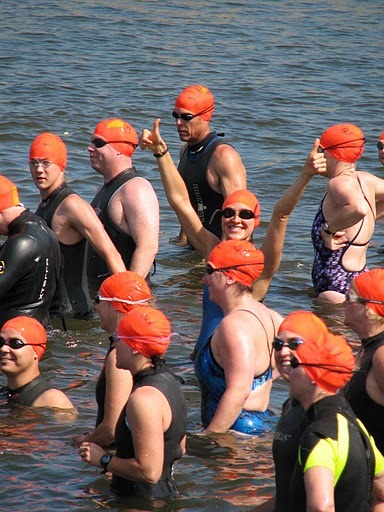 Less than a month to go until the 4.4-mile Great Chesapeake Bay Bridge Swim on June 12! Now that the weather’s warming up, and now that my swims are getting longer, it’s getting easier to imagine waking up one morning in June, eating the largest bowl of oatmeal known to man, then jumping in the Bay to swim across it. 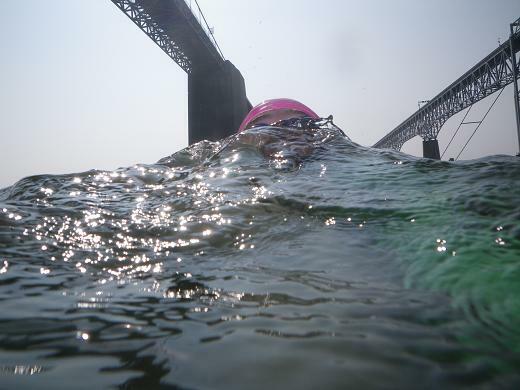 This makes it a perfect time to share a roundup of resources for the swim—lessons learned from my own experiences at the 1-Mile Chesapeake Bay Bridge Challenge, from this round of training, and from lots of wise people who have swam the full Bay before. Before the 1-miler in 2008. The “Cuisinart start” is real. Be prepared for combat as hundreds of bodies clamor for space in the water. As a swimmer-friend told me before my first one: You may get kicked in the face. You may kick someone else in the face. Don’t apologize; just keep swimming. Try PAM. Yep. The cooking spray. Spray it anywhere you don’t want to chafe. Which is to say, just shellack yourself. Learn to love your wetsuit. Here’s how I learned to stop worrying and love my wetsuit: I learned how to put it on without the dreaded wetsuit dance. Here’s how: Bring a plastic grocery bag to the race. Put the bag over your foot when you put the wetsuit on. Remark about the ease of sliding your leg into what previously felt like double-sided tape on your skin. Lessons I’ve learned from this training cycle: Is it bad when you can identify things you missed in training before race day even arrives? Rotator-cuff strengtheners would have been nice to begin six months before starting my long swims. I simply didn’t realize how hard it would be on my shoulders to swim more than 5,000 meters at a time. A month or so into training, my shoulders unleash a symphony of snap-crackle-pops at me every time I stretch them. Long swims will keep you confident. The more I talk to people who know what they’re doing, the more I think my training plan, which was thrown together based on little more than the race’s total distance and my experience as a high-school swimmer, actually seems pretty legit. I feel especially good about the long swims I’ve been tackling roughly once a week, and have noticed a marked difference in my swimming fitness since starting them. Swimming to Hemingway’s, a blog dedicated to Bay Bridge Swim training, has a helpful post-race report from 2009. Favorite excerpts: The focus on, as the title suggests, swimming to Hemingway’s, the terrific Bayside seafood restaurant at the end of the race. And the appropriately named workout, “The Hemingway,” which consists of a 1,000 followed by three 2,000s to roughly equal the distance of the race. Rob at RobAquatics.com offers another terrific post-race report from the 2010 swim. Lots of excellent stuff here, including a great anecdote about a guy in a support boat tossing him part of a banana. Also, gorgeous photos that will make you feel like you’re in the Bay NOW. Mid-race self portrait courtesy of Rob Dumouchel. The two things that have the greatest influence on the swim are the bay currents and the wind. Watch WBAL, Baltimore, Channel 11 for Bay forecasts. If the wind is from the west (very rare) it will be a great swim for everyone, from the north (very rare) tough on left side breathers and from the east, very bad for everyone. The race is timed so that slack current occurs during the middle of the race for the vast majority of swimmers. It moves from the north to the south most of the swim. You can judge where you are just by glancing at the span on the side where you regularly breathe. If the bridge starts to grow or diminish you might want to take a quick look ahead to make sure that you’re swimming straight down the middle. The current will increase in a southerly flow at the end of the race. Don’t get too anxious about getting close to the southern span. You’ll see the pillars on the south side and perhaps the numbers on them. Ignore the numbers; they will repeat themselves and give you false hope. ((This tip is especially helpful … like someone telling us that we’ll start seeing 24-mile markers starting at mile 20 of a marathon)). Keep swimming until you touch the bottom twice. Standing up will be more painful than you might imagine. Crawling is acceptable. ((This made my stomach turn a little)). Have you done the swim, or are you training for it? Share your best advice/resources/lessons learned below! ok, my long swim is 3200 and that is your regular daily swim. which makes you stupendously awesome. also, thanks for the wetsuit post the day before my race – i bought body glide but will pick up some PAM, although i am skeptical! so excited about how close you are getting to this swim – i wish we could track you online like marathoners!!! and congrats on your run last night. it’s good to be back, isn’t it? I am completely fascinated by you doing this race. I love reading about it and can’t wait for it to happen! I am so impressed with your preparation for this race. You’ve got the workouts in, and you’ve done your homework and found some really great tips. Thanks for sharing and I’m so excited for your Big Swim!! I get SO excited when I encounter anything related to the swim, I keep coming back to your page for new info and my stomach gets flippy every time!! I can’t wait! !